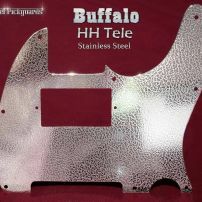 commented on "Buffalo H H Tele Pickguard Stainless Steel Etched Chrome Guard for Fender Telecaster HH"
The Buffalo Telecaster HH guard has a fine leather-like pattern etched permanently into the steel, then polished to a glassy chrome gleam. 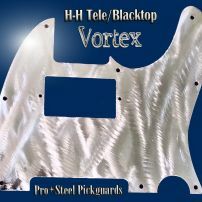 A very durable scratch resistant surface. 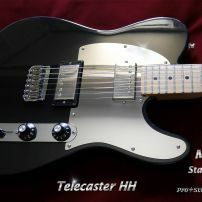 commented on "* IN STOCK * 'SILVER STACCO' BLACKTOP or HH FENDER TELECASTER METAL PICKGUARD WORLWIDE AIRMAIL"
commented on "Vortex Stainless Steel Guard for Fender HH Telecaster Carved Metal Chrome Bling Tele Guard"
Hand carved & smooth polished to touch, this is a dynamic effect under any light conditions. 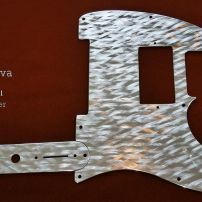 An illustrious smooth finish. Matching Control Plate can be added by request. 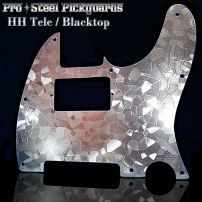 commented on "Kaleido HH Tele Guard or Blacktop Telecaster Etched Mirror Stainless Steel Pro Steel Pickguard"
Etched Mirror Stainless Steel. 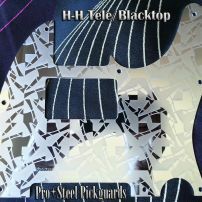 A cool star type design etched permanently into a polished mirror stainless steel surface, for Fender Blacktop or HH Telecaster.